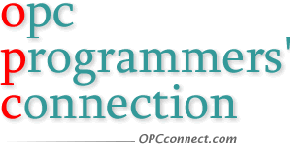 OPCconnect.com is an indispensable resource dedicated to the needs of the software/solutions developer working with OPC (formerly OLE for Process Control). To find out more, see 'About This Site'. OPC Foundation owns all OPC trademarks including the OPC logo used throughout this site. You may visit the OPC Foundation website at www.opcfoundation.org. The Matrikon Flex OPC UA SDK is a high-performance developer toolkit that quickly and easily enables any application, regardless of size, with OPC UA. Click here to learn more! Find industrial solutions offered by MatrikonOPC that you did not know existed! All OPC Servers and all industrial Communication Solutions that MatrikonOPC offers are compiled in one document. Download it now. The purpose of this forum is to provide connectivity advice for everyone in the industrial and commercial markets. To access the forum, please visit here. The Industrial Internet of Things is everywhere, and it’s redefining the manufacturing industry with an unprecedented level of impact. Click here to read more on how Microsoft is helping. The benefits of OPC UA are described in a short, easy to understand video. Watch the video from here. Watch this OPC Foundation video produced collaboratively with Matrikon to get a clear, high level overview of the IoT landscape both for vendors looking to adopt the IoT in their products and services and for professionals in companies that will use this technology to better compete today and in the future. Download the video from here. Industrial UA Modbus Gateway provides secure, powerful and broad connectivity to access data from RTU’s, PLCs or any other devices that use the Mobus data protocol. Click here to get more details. Learn more about UA Compliance Test Tool with videos and tutorials posted by OPC Foundation and its members. Watch the tutorials here. This one day conference will provide engineers, project managers, and control automation professionals with data connectivity and security information they need to increase the performance, efficiency and safety in their projects. Click here for more information and registration. The MatrikonOPC has released a new industrial data logger. This product is ideal for collecting data at remote locations and small facilities. It provides reliable and secure data delivery in one easy-to-configure device. Visit The Matrikon Industrial Data Logger page for more detailed information on this specific product. The 2013 North American OPC Interoperability Workshop is THE event for testing OPC products for interoperability and will be hosted by Honeywell in Phoenix, AZ April 22-26, 2013. In addition to testing, this event provides an ideal opportunity to network with your peers, learn about OPC technology, and to interact with industry-leading experts. Click here for more information and registration. The OPC Foundation Released a BETA version of the UA Compliance Test Tool. Download the UA CTT from here. Countdown to OPC Technology Summit 2012 - Commence now! The OPC Foundation's OPC Technology Summit 2012 is scheduled for October 16-18, in Orlando, Florida, USA, at the Renaissance Orlando at SeaWorld. If you develop OPC products, use OPC solutions, or want to know more about OPC technology and its benefits, then you cannot miss this important opportunity. Hear from end users, OPC product developers and keynote presenters, including a cyber security expert and a noted industry author. Open to OPC Foundation members and non-members. Mark your calendar for the OPC Foundation's OPC Technology Summit 2012, scheduled for October 16-18, in Orlando, Florida, USA, at the Renaissance Orlando at SeaWorld. If you develop OPC products, use OPC solutions, or want to know more about OPC technology and its benefits, then you cannot miss this important opportunity to learn and network with the OPC experts. Open to OPC Foundation members and non-members, the multi-day event features presentations on OPC UA technology, solutions and value proposition. Hear from end users, OPC product developers and keynote presenters, including a cyber security expert and a noted industry author. The OPC Foundation released the new version of the OPC UA Specifications Part 13 - Aggregates RC 1.02.10 Specification. It's available on the OPC Foundation website and can be downloaded from here. OPC Update is a newsletter published by Automation.com in collaboration with ISA and InTech. View the latest issue here. The OPC Foundation released today a new version of the OPC UA Specifications 1.02. It's available on the OPC Foundation website and can be downloaded from here. Transylvania University of Brasov (Romania) releases 2 OPC UA whitepapers Design and implementation of UA Aggregating Server and Efficient Address Space Generation for a UA Server. See all available Books and Whitepapers. A new version of the UA .NET SDK (Build 333) has been posted which contains changes to the licensing of the source code, along with some bug-fixes. OPC Foundation - recently released an OPC UA compliance test tool. Download the OPC UA CTT from here! The OPC Foundation and Automation World released OPConnect Issue 27. The newsletter can be found here.